My daughter Sadie hides anxiously behind the living room couch, while her best friend is searching, calling out her name, and trying to find her. Hide-and-seek, a game played out millions of times. If you don’t know, hide-and-seek is a popular children’s game in which any number of players conceal themselves in the environment, to be found by one or more seekers. The hiding is not what makes it fun. Kids will play for hours and hours when they continually find each other. When one of the children stays hidden for even five minutes too long, the others quickly lose interest. It is a quest fueled by the moment of discovery. Now let’s think about why thousands upon thousands of content marketers, business owners, hobbyists, and fans start podcasts. More often than not, it’s to build an audience around a topic they love. They start with enthusiasm and determination, only to quit after 10, 12, or 20 episodes (the number doesn’t matter, the quitting does). Listeners couldn’t find their podcasts, so they quit. Like Sadie hiding behind the couch, when no one finds us, the game ceases to be fun and we quit. Podcasts need to be actively optimized — not only to help you build an audience and authority, but also to help you stay motivated to not quit. The consensus amongst podcasters is that since Google can’t index audio, you can throw your standard SEO practices out the window. It is true; Google can’t listen to or index your podcast episodes. It is also true, and more pertinent to this discussion, that Google is not where people go to find podcasts. Where do people search when they want to find a new podcast? These are “alternative” search engines — directories where people search for podcasts. It’s not accidental when podcasts rise to the top of the directories. We need to understand our audiences and anticipate what they search for just like we do when we write, but with a slight twist. What if you could spend 10 minutes doing one simple task and get new listeners for years to come? We need to find audience-building strategies we can leverage. Repeatable steps we can take upfront, yet will continue to provide us with new listeners for months and years to come. The way to do this is simple: submit your show to podcast directories. As with most things, how you use podcast directories will change and evolve with your show. A brand-new show will benefit from a different strategy than a podcast that has been around for 50+ episodes. New podcasters: Focus on one or two directories to maximize early exposure. Use iTunes and Stitcher to start. Veteran podcasters (50+ episodes): Submit to as many podcast directories as possible. Here’s a list to get you started. As podcasters, we value audio over text. The reason is simple: we are more comfortable behind a microphone than we are behind a keyboard. Our thoughts and ideas flow when we speak, and we stare impatiently at a blank page when it’s time to write. Don’t fight it. It’s what makes us podcasters. It also stops us from being found. There are a few places where words matter in podcasting. Not a lot of words, but they are essential to help listeners find your show. For our discussion today about optimizing for discoverability, we are not going to get into anything involving extra work. Yes, having transcripts for your show can be beneficial, but we are focusing on tasks you already must do for your podcast — but doing them with a purpose. Deciding on a name for your show can be a fun and creative process, but we need to stay focused on our goal of discoverability. Know your audience. Who are they, where do they listen, and how can your show help them? Use their words, not yours. How would a listener describe your show to a friend? Use those words. Stand out. Be bold and clear. Next time you’re on the subway or at a coffee shop, look at how fast people scroll up and down on their phones. Your name needs to effectively communicate your show’s purpose, and it needs to do it in seconds. A good name isn’t easy to find, but never sacrifice clarity for creativity. Where a show description is displayed varies from directory to directory. Currently, iTunes still generates the majority of all podcast downloads. So we will focus on iTunes when discussing show descriptions. A show description is the block of text displayed on your podcast page within iTunes. More importantly, it is the main place where you get to tell iTunes and potential listeners what your show is about. Choose the right keywords. Include the words and phrases your audience uses. Max it out. iTunes has a 4,000-character limit — use every last one. Call to action. Listeners will read your show description, so explain what they should do next. Think of crafting your show description the same way you would think about writing your next blog post. Keywords matter, but not more than other important elements that help you create a compelling case for a potential listener to download and subscribe to your show. Content marketers and copywriters stress over their headlines more than any other part of their work. It makes sense when we understand how a headline can make or break an article. The title of your episode is your headline. It is the single most powerful way to make people stop scrolling and listen to an episode. So don’t treat episode titles like afterthoughts. Don’t mislead. 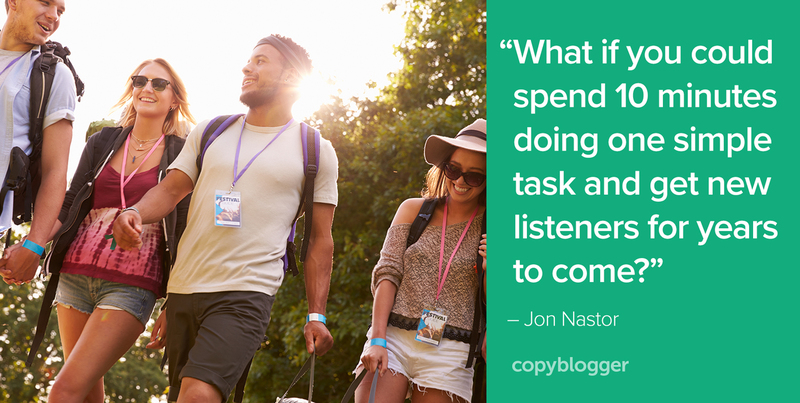 The goal is to attract listeners, not make them despise you for wasting their time. Be specific. What is the single most useful benefit your episode will provide? Yes, be that specific. Consistency is key. Number your episodes or don’t. Include your guests’ names in your titles or don’t. Either way, be consistent. Writing great episode titles takes practice. When you get stuck, you can jump-start your process with these smart headline-writing tactics. When you listen to kids playing hide-and-seek, you will notice all of the noises they make — laughter, whispering, and yelling — all signals that will help them be found. We need to make noise, get noticed, and be discovered. Creating useful content on a consistent basis is essential if you want to create a remarkable podcast. Your usefulness stems from your passion and knowledge. Podcasting is hard, but having your show discovered by new listeners on a consistent basis will keep you motivated through the dips and struggles. You started a podcast to build an audience. Don’t hide it from listeners. Jon Nastor is the author of Hack the Entrepreneur: How to Stop Procrastinating, Build a Business, and Do Work That Matters. He is also the host of Hack the Entrepreneur. I have a podcast network and I never wanted to take the time to submit the audio to all the different platforms but after reading this I will give it a show. Let’s see what happens. Submitting is definitely worth the effort. There’s a lof of directories out there, so sort them by relevance to your podcasts, and roll from there. Our version of “hide and seek” gave one kid a ten-minute head start and the other two a dog who loved to scent-track people. There’s no way to extend that metaphor to podcasts, although filming the dog would’ve been fun. Meanwhile, I’m seeking an Occupy Mars t-shirt. That’s so cool. Thanks for this motivation to submit to more podcast directories. I am curious about the “call to action” in the show description – what might that look like? Listen now? Tune in if you want to learn X Y and Z? Subscribe now? That kind of thing? For a call to action, focus on the main benefit the reader will get by listening — how will you help them solve their biggest problem? Yes, do like you said here, Tune in if you want to learn X Y and Z? Subscribe now? This is wonderful post. I totally agree with the fact that new comers should focus on limited spaces and make themselves visible on there before jumping to all the platforms and getting no results. Love the post and totally agree. I would also like to say that a good blog with the podcasts available or a link to them with the content completely or partially transcribed might help as well with visibility. Hey David, I absolutely agree with transcriptions — they give search engines something to crawl. Jitendra, you are more than welcome. I’m glad you dug the article. It really triggered me how you started with the story of your daughter. I used to play hide and seek but with the work. I totally agree with your point of podcasters quitting after a few episodes. Success doesn’t come overnight. People search for more and podcasters should definitely try new directories for better search results. Ravi, you’re welcome. I’m glad you dug it. You have to promote. It is not enough to create a podcast and wait for people to come. You have to promote your podcast for it to gain any exposure and directories are a great starting point. I really enjoyed this Jon! The comparison with ‘hide and seek’ was great. I particularly liked the part about episode titles, as to me, nothing is more off-putting than misleading titles – something that personally, I am very aware of, even more so after reading this. Calum, misleading and inconsistent titles are two of my pet peeves. I’m glad you dug the article. Thank you for sharing this great information. I am not podcasting as of yet, but reading your post gives a valuable look into how to do things right.